One of our favorite topics on The Glambassador is eyebrows! Eyebrows add structure to every face and highlights our eyes better than any black eyeliner can. Over-plucking or over threading eyebrows makes a person older than their actual age and is a common mistake among alot of women. But learning the simple basics to eyebrow grooming can help you from making that mistake. We all have a natural structure to our brows. Use that to your advantage. If you have straight brows, don't try to make an arch. It'll end up making it look like something is totally off. But by using the illustration above, you can easily bring out your natural eyebrow structure. (2) Look start in the mirror to see where the highest point of your eyebrows are. That will be your arch. This is also where you being to "thin out" the eyebrows. From the arch to the end is where the amount of hair is lesser then the beginning. 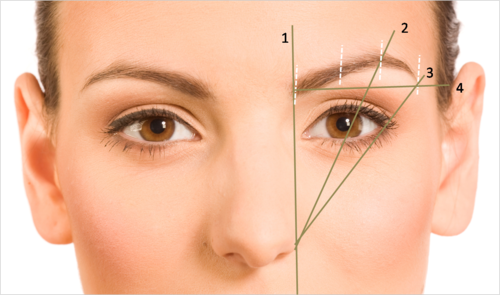 (4) Grab the pencil once more and line it in a straight line from the beginning of the brow to the end of it. Get it as straight as you possibly can. The beginning should be in the same "imaginary line" as the end of the brow. Repeat the same process for the other brow. If you are currently growing out your brow or need some extra help, check out our previous articles about eyebrow stencils and how to make them.